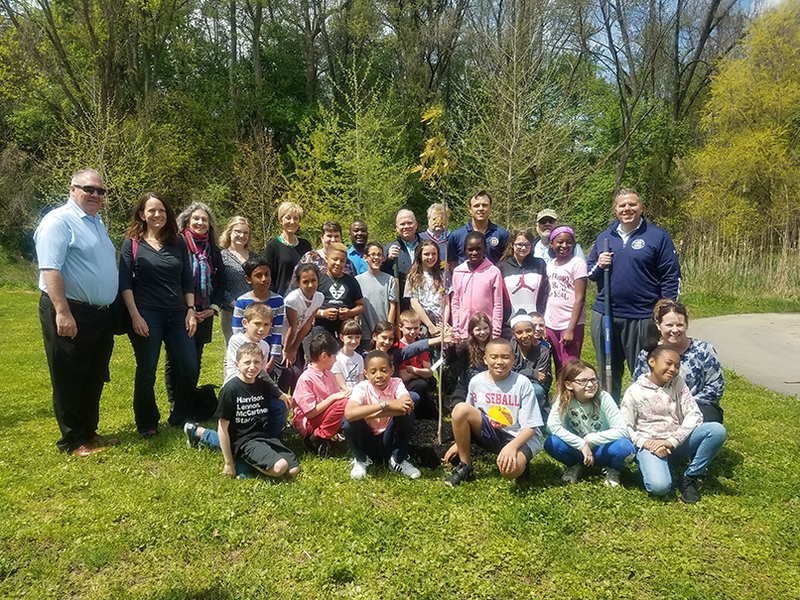 In honor of Earth Day, Delaware County Council joined members of the County’s Parks and Recreation Department, the Delaware County Conservation District, various Friends Groups of local parks and students from Primos Elementary School to plant trees along the Darby Creek on April 22. On April 22, 1970, millions of people throughout the country came together to rally for protections to safeguard our planet for future generations. The first Earth Day helped transform the ways we interact with the world around us, and it changed how we view the impact on our planet. It also inspired the creation of the Environmental Protection Agency and sparked legislation that protects the air we breathe, the water we drink, and the animals that live alongside us. All living things have an intrinsic value, and each plays a unique role and we must work together to protect endangered and threatened species and the resources that we all share. The 2019 Delaware County Earth Day project was part of ongoing maintenance at Kent Park. In 2013, the County’s Parks and Recreation Department and the Delaware County Conservation District installed a riparian buffer planting along the floodplain of the Darby Creek area. The project complemented a dam removal and stream bank stabilization project. Trees and shrubs were also planted to provide for additional wildlife habitat and rain gardens were installed to infiltrate runoff from the bridge above and the adjacent paved path. Last month, an inspection was done to determine the maintenance needs of the rain gardens, the landscaping and riparian buffer. AmeriCorps volunteers provided maintenance a few weeks ago and the final step is to plant trees along the creek. Council is proud to be contributing to this part of the project and will be joining Parks and Recreation staff and members of the Conservation District and Friends of Darby Creek to plant the trees. Council encourages all residents to participate in Earth Day and participate in a project in their community or in their own backyard.